can be Laser engraved with your dog's information. Both sides can be customized. 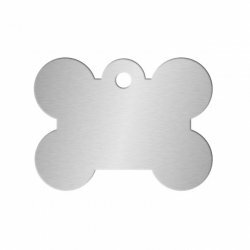 Unlike most other bone shaped tags, ours are made of stainless steel (instead of aluminum) and will last the lifetime of your pet. The text is laser engraved using which leaves a dark, deep etching which you can feel with your fingers and will not wear down or rub off. See an example of a fully customized Bone Shaped Pet Dog Tag for a pet.